Well the quilt is not on Rosella’s bed yet!! And that is because I’ve been having other fun with my family on these holidays, but I AM working on it steadily every day. 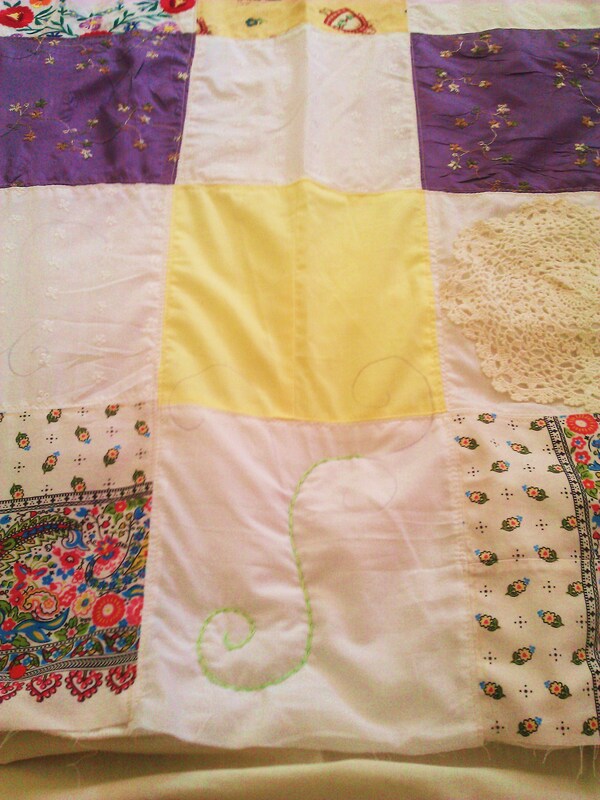 The photos are a bit blurry, but here it is unstitched while I was deciding where the squares would go. And here it is all stitched together – everything in this quilt has been used before: there is a cut-up embroidered blouse, bits of dress and a pair of purple pants that I made years ago and never wore, fabric from my mum, fabric from my friend Christina, doilies from an op-shop, and left-over bits and pieces form other craft projects. 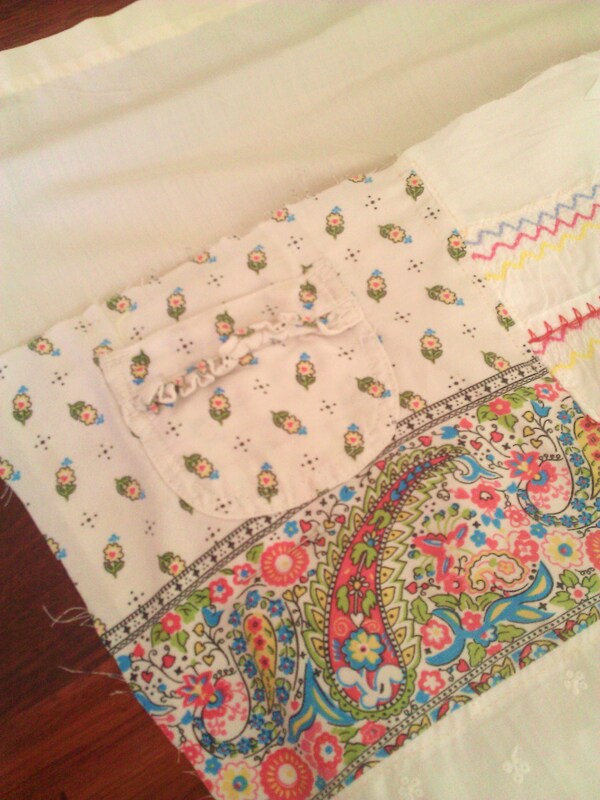 I had some pretty edgings on old pillow cases that I cut off and sewed on to some of the squares, along with the ruffled sleeves of the embroidered shirt. This patch has a pocket on it for her treasures: it came from a cute little dress she used to wear. I would have put the dress away for Linden but the front of it was pretty grubby. The fabric was just too beautiful to throw away. 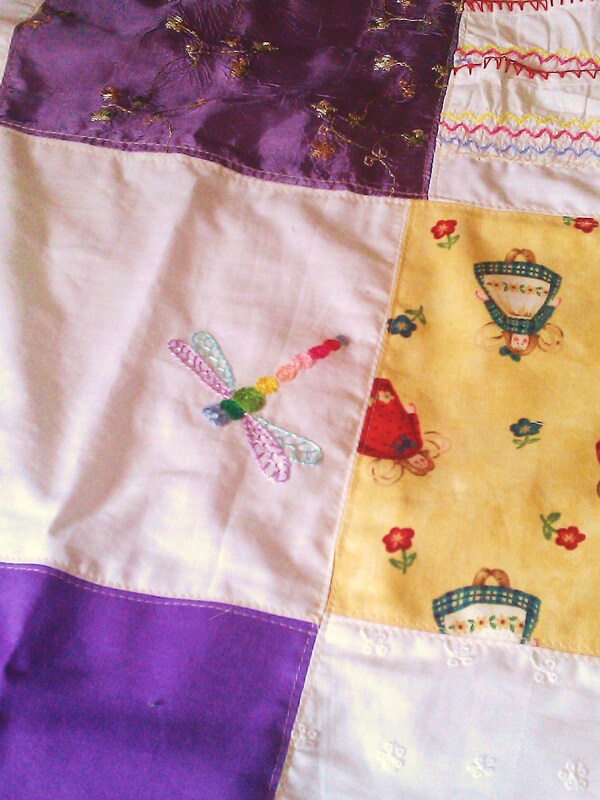 This one is a dragonfly I embroidered when Kaelan was a baby. It was intended as a sheet set for his cot, but as he so rarely used his cot it didn’t seem worth finishing! And here is where I have begun the quilting. I am using a really lightweight quilt from Ikea for the middle part, and an old sheet from my bed as the backing. The quilt is the only thing I have purchased for this quilt … it is synthetic, but washable and it was only $10. 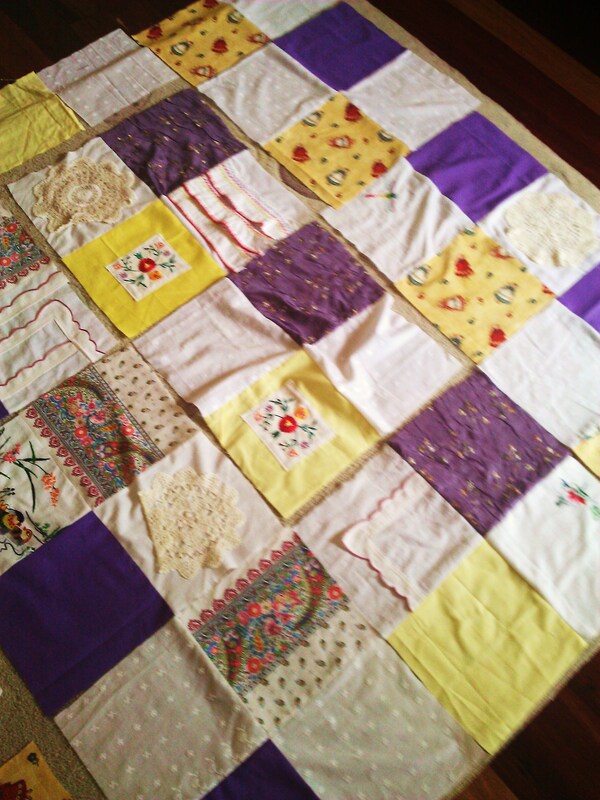 A patchwork quilt for $10 … not bad, hey? 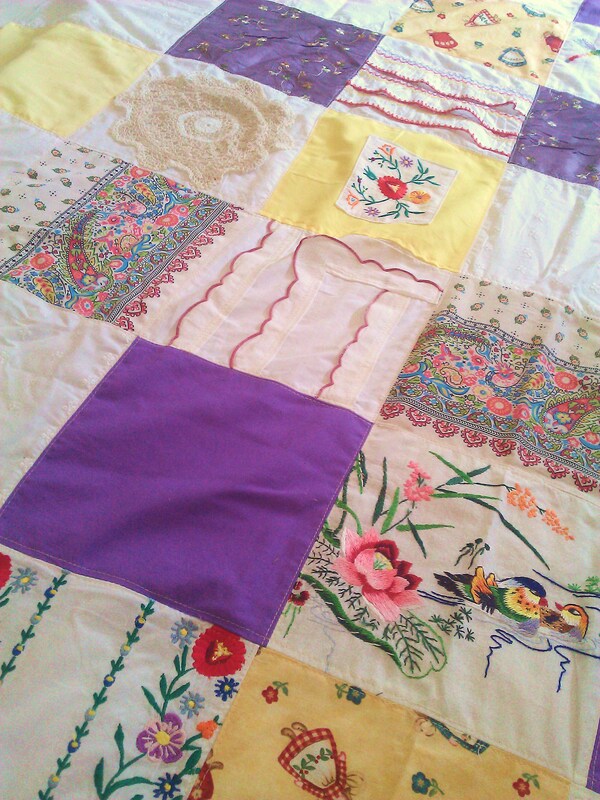 hand made, patch work quilt, thrifty sewing projects. ← Unsticking the Lavendilly Chi for 2011 ! It looks quite lovely, the colours are some of my favourites. All the quilts in the Carter household were made from clothes that had needed a new life and the backing from sugar and flour bags that were taken apart and reused. Also the the batting was either an old flannette sheet or a wool blanket. I look forward to seeing it when we are down next.